Background: Pathway enrichment techniques are useful for understanding experimental metabolomics data. Their purpose is to give context to the affected metabolites in terms of the prior knowledge contained in metabolic pathways. However, the interpretation of a prioritized pathway list is still challenging, as pathways show overlap and cross talk effects. 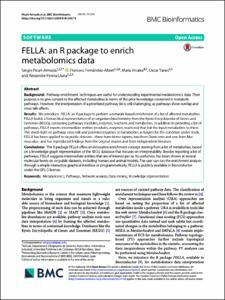 Results: We introduce FELLA, an R package to perform a network-based enrichment of a list of affected metabolites. FELLA builds a hierarchical representation of an organism biochemistry from the Kyoto Encyclopedia of Genes and Genomes (KEGG), containing pathways, modules, enzymes, reactions and metabolites. In addition to providing a list of pathways, FELLA reports intermediate entities (modules, enzymes, reactions) that link the input metabolites to them. This sheds light on pathway cross talk and potential enzymes or metabolites as targets for the condition under study. FELLA has been applied to six public datasets -three from Homo sapiens, two from Danio rerio and one from Mus musculus- and has reproduced findings from the original studies and from independent literature. Conclusions: The R package FELLA offers an innovative enrichment concept starting from a list of metabolites, based on a knowledge graph representation of the KEGG database that focuses on interpretability. Besides reporting a list of pathways, FELLA suggests intermediate entities that are of interest per se. Its usefulness has been shown at several molecular levels on six public datasets, including human and animal models. The user can run the enrichment analysis through a simple interactive graphical interface or programmatically. FELLA is publicly available in Bioconductor under the GPL-3 license. Picart, S., Fernandez-Albert, F., Vinaixa, M., Yanes, Ó., Perera, A. FELLA: an R package to enrich metabolomics data. "BMC bioinformatics", 22 Desembre 2018, vol. 19, núm. 1, p. 538 1-538 9.